A 52-year-old Co Armagh man allegedly seen by his son ‘slicing’ his girlfriend’s throat with a 20cm long kitchen knife, went on trial on Monday for the January 20 murder last year of Anita Downey. Craigavon Crown Court, sitting in Belfast heard that David Lyness later claimed that it had been his 51-year-old former fiancee who had attacked him in the living room of his Toberhewny Hall home in Lurgan, that her death was “an accident .... and through no fault” of his. 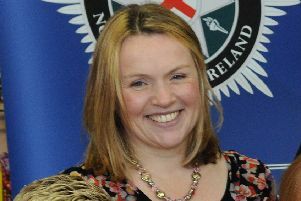 However, prosecution QC Neil Connor told the jury of seven men and five women, it was their case “this was no accident” and that “the evidence points overwhelmingly to one conclusion: “That the defendant armed himself with a knife and used it to deliberately and intentionally inflect serious, and ultimately rapid fatal injuries to the deceased, with at the very least, the intention of inflicting really serious harm”. Judge Geoffrey Miller QC and the jury also heard that according to the post mortem report of assistant State Pathologist Dr Christopher Johnston, “essentially Ms Downey had bled to death”, after the long muscle of her neck was completely severed, “to the level of the spine, with the major injury being to the internal jugular vein”. Mr Connor added that Dr Johnson noted in his report, that the “appearance of this wound was in keeping with more than one movement of the blade .... in keeping with the description of the defendant ‘sawing’ at the deceased’s neck”. He also noted, said the prosecution lawyer, other blunt force injuries, consistent with blows, such as punches. Earlier Mr Connor claimed Lyness’ young son had initially witnessed his dad sitting astride Ms Downey, beating her about the head, and face, telling her: “I’m going to beat you up”. He then got up, pushing past his son before returning from the kitchen with the large knife. He retreated to the stairs after his dad threatened him with the knife, but immediately returned on hearing Ms Downey “screaming for help”. Opening the livingroom door he saw “blood everywhere” his dad, astride his former girlfriend as before. However, this time he was holding her head up by her hair, while at the same time “sawing at the left side of her neck”. As the younger Lyness ran from the house, followed by his father, he raised the alarm, and in the emergency 999 call, the clearly distressed teen was taped saying: “My dad has just sliced his girlfriend’s throat”. Mr Connor said although they had been together for about three years, and been engaged, a month earlier, Lyness had told Ms Downey he wanted to end their relationship. However, while in his own words, Lyness was attempting to “gently let her down”, they spent that fateful January on a trip to Belfast. But, said Mr Connor, they returned to Lurgan earlier than planned, and separated at the station, Lyness going home, and Ms Downey to a local bar. She then went to his home, and for a time things were fine, listening to music, with her sometimes dancing, but things deteriorated. During his police interviews Lyness claimed that Ms Downey then came at him “with a knife in her hand”, and although frightened and ‘fairly drunk’ himself, managed to fend her off before trying to “grapple for the knife”. Lyness further claimed that as they were “scrambling about for the knife” he noticed a lot of blood, realising that “something drastic” had happened. Ms Downey, he said, still had the knife in her hand, and on her knees, before falling down. Mr Connor said that Lyness told police: “It was an accident - it was though no fault of mine”. The trial continues and is expected to last until the end of the month.